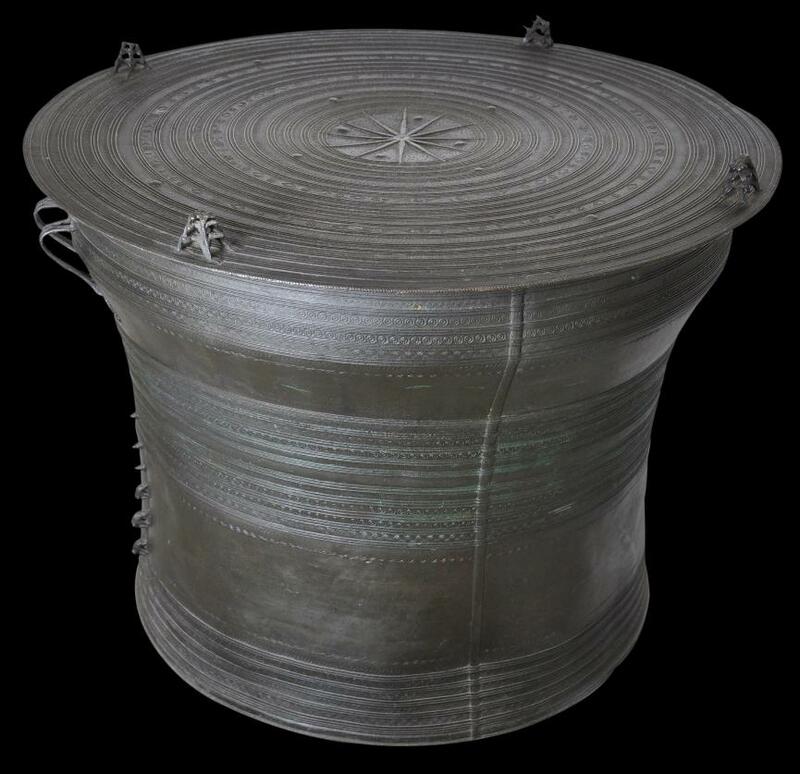 The drum is cylindrical and waisted and has clear markers to origins in Eastern Burma with the Karen people, but it is part of a wider tradition of bronze drum making in Southeast Asia and South China, a practice that goes back many centuries. Such drums seem to have been traded from the earliest times, judging by their distribution today. Sometimes they were offered as tribute to overlords (Fraser-Lu, 1994, p. 140). In the 19th century they tended to have been made by Karen craftsman for Shan clients. 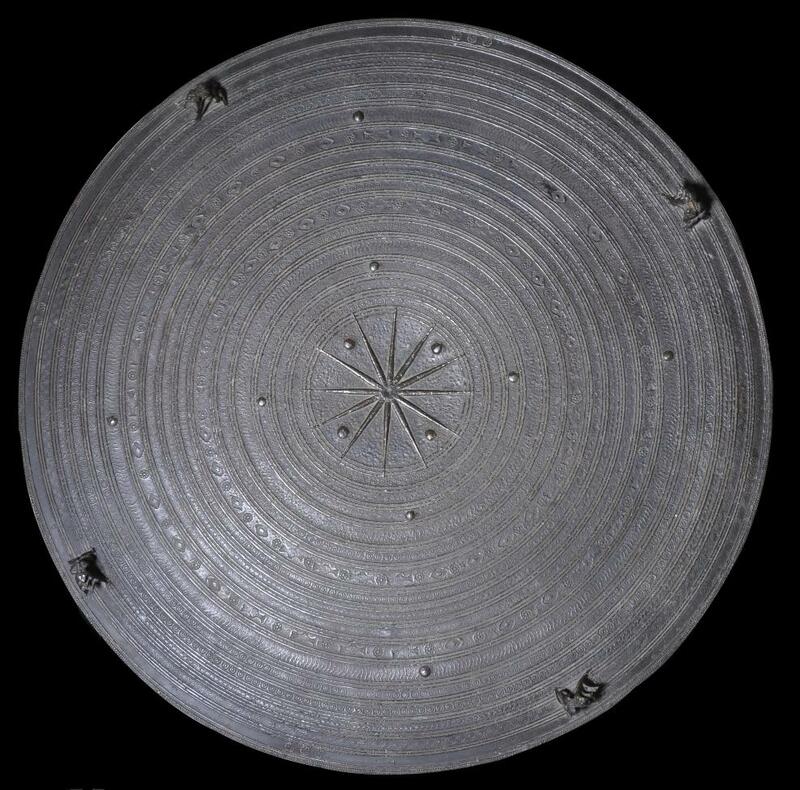 This example, with two pairs of handles around the sides, has a round, flattened top with four groups of three frogs placed equidistant around the edge of the tympanum. 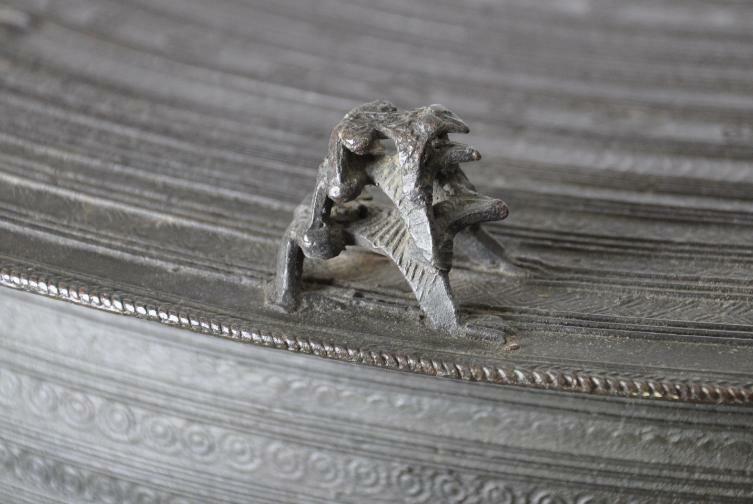 The frogs are placed atop each other, from largest to smallest. 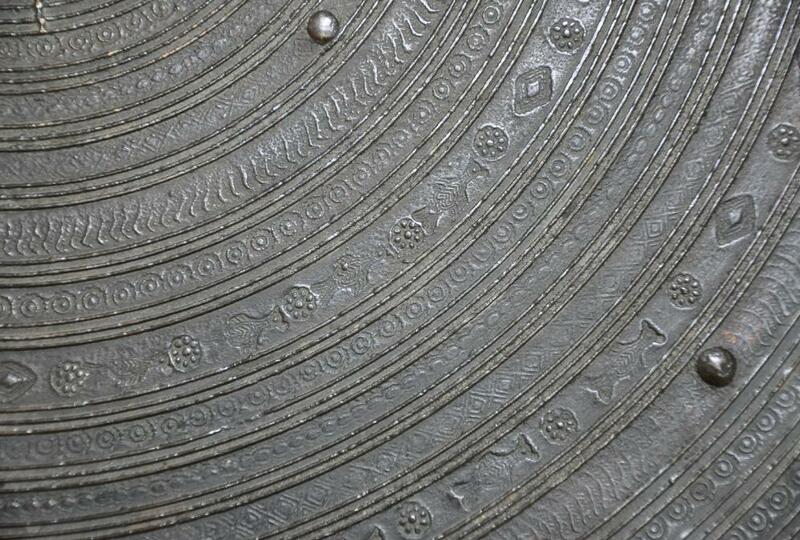 The tympanum is also decorated with a central star or sun burst motif around which there are numerous concentric bands filled with repeated duck, aquatic flower and stylised seed motifs. 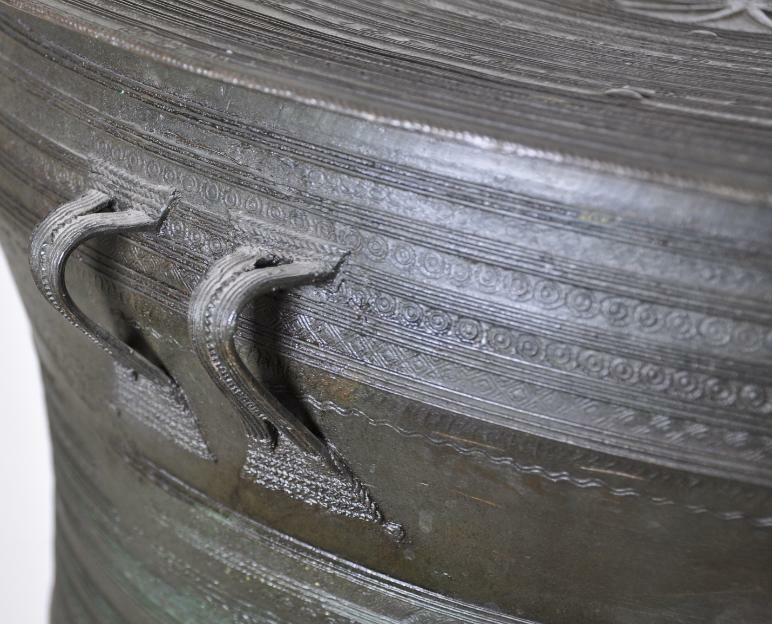 Along the side of the drum following a seam is a row of three solid cast elephants and three snails of ascending sizes. nat spirits. Possibly, the drums were also beaten in conjunction with rice planting festivals to encourage the rains – sometimes they are referred to as rain drums. This association with rain no doubt accounts for the use of the frog, duck and fish motifs for example. It is also possible that seed rice was stored in the drums prior to sowing. 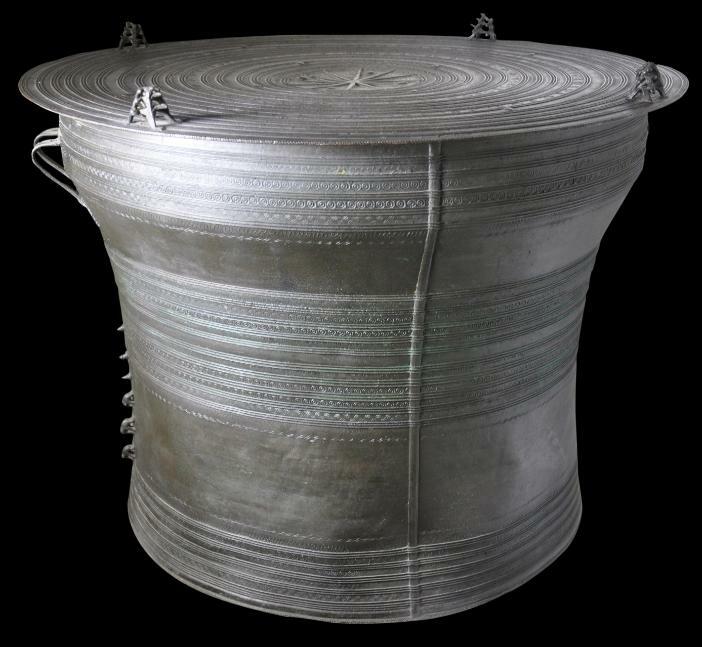 The Karen do not appear to have cast such drums themselves but commissioned them form Shan craftsmen who cast the drums using the lost-wax process. According to Fraser-Lu, the Shan artisans had to undergo various purification rites at an auspicious hour determined by an astrologer prior to commencing casting on account of the ritual importance of such drums. The drums made by the Shan also were exported to buyers in Thailand, Laos and Cambodia. et al (2011, p. 93). The condition of this example is very fine. There is a small casting-related fracture to one side of several centimetres but this is closed, stable and typical of the somewhat rudimentary casting methods employed by the Karen. It has a dark grey-black surface patina. The tympanum particularly has obvious wear. 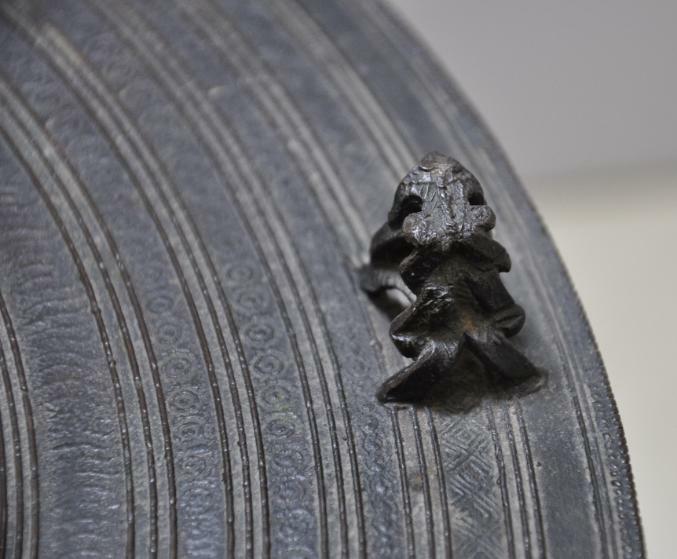 Overall, it is a fine example of a Southeast Asian frog drum. 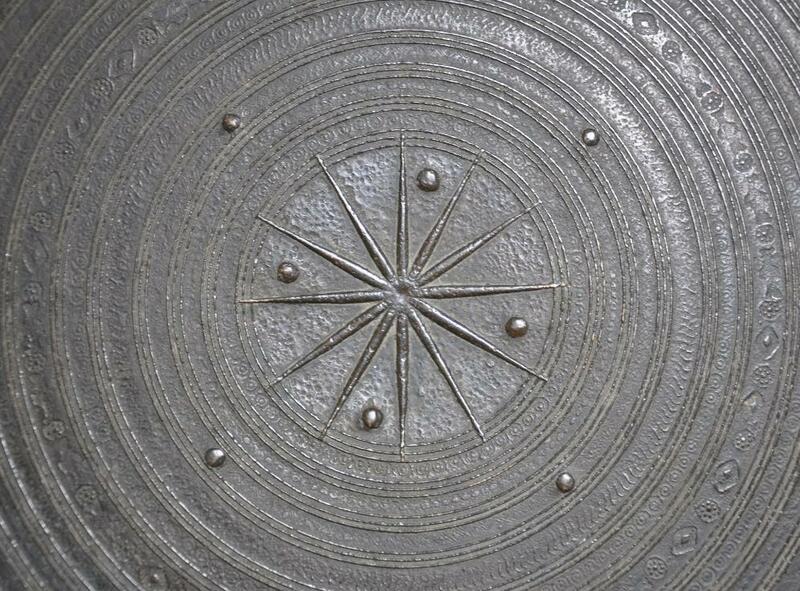 It was acquired in the UK and most probably was brought to the UK from Burma during colonial times. It is clearly at least 19th century – which is important. Many available today are much later reproductions. Bruley, Y., et al, Le Siam a Fontainbleau l’Ambassade du 27 Juin 1861, Chateau de Fontainbleau, 2011. Treasures of Two Nations: Thai Royal Gifts to the United States of America, Smithsonian Institution, 1997. Art from Sri Lanka & Southeast Asia: Asian Art at the Norton Simon Museum, Yale University Press, 2004.